They could have used that power to fundamentally improve the lives of ordinary Americans. They could have passed all kinds of incentives to keep corporations from “outsourcing” jobs and hiding and parking their profits overseas. They could have routed vast sums of money to rebuild deteriorating highways and bridges that Americans rely on every day. They could have bolstered up Medicare and Social Security, ensuring that millions of citizens enjoyed a dignified and prosperous retirement. They could have helped families pay for their kids’ college educations. They could have funded all kinds of services that would improve the quality of Americans’ lives. Instead, they chose to do the exact opposite. They chose to reward the corporate conglomerates who had bankrolled their political campaigns with millions of dollars in campaign ads and ghost-written voter suppression laws. They completely turned their backs on the ordinary people who had voted them into office. 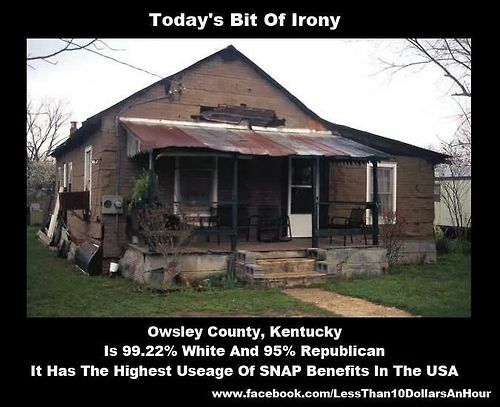 And they did this knowing full well that their big, ballyhooed tax “cut” was really nothing more than a huge tax giveaway to the nation’s wealthiest, that would not do a single thing to help the people who had voted for them. They knew that as long as they kept repeating the time-tested mantras of “abortion” and “undeserving” and “illegals,” that their gullible voting base would swallow whatever snake oil they could cook up. That’s why they never even bothered to mention their “tax cut” in their re-election campaigns last November. They knew it was all an embarrassing scam. They were all in on it. Every single one of them. And now, safe in their cushy corporate sinecures they had all pre-arranged before the voters wised up and kicked them out of office, they’re having a good laugh at everyone else’s expense. Yes, the Republicans Bad worded Americans over good, and they’re not looking back. Now the returns are literally coming in—and it’s dawning on ordinary folks how badly they were conned. All told, about three million more Americans will end up owing the IRS money than last year, before the Republican tax plan took effect. So not only will the Republican tax “cut” have failed to do anything to help the economic prospects of ordinary Americans, it may very likely end up resulting in an economic slowdown that could haunt the present administration as it tries to tout its achievements, going in to the 2020 elections. Waaaaaaa! My withholding was correct so I don't get to give uncle Sam an interest free loan of my own money!!! Waaaaaa! People who get always get refunds are not doing their taxes right. Right. Millions of Americans have been doing their taxes wrong all these years. I'm sure they will take that into consideration at the voting booth in 2020.
the ""conservatives""....Where are the tea baggers with all their misspelled signs? "So not only will the Republican tax “cut” have failed to do anything to help the economic prospects of ordinary Americans, it may very likely end up resulting in an economic slowdown that could haunt the present administration as it tries to tout its achievements, going in to the 2020 elections"
The halfrican doubled the National debt. Yes, if you regularly get refunds your withholding is too high. Ask any financial advisor if they believe given an interest free loan to the government is sound fiscal advice. Just a destabilized middle east, a weakened military, record high unemployment and lowest workforce participation rate ever seen. Billions to our enemies and men in women's locker rooms. Thanks Obama!! Yep...you can make interest on that money rather than the gov. It's not a big issue for most...but you are right. Trump has paid no taxes for the past ten years. States are also going after proles for back taxes. State taxes are not a deduction anymore. This story was trending on twitter. There are some pissed off former trump supporters there crying in their beer about it, ha, ha. It looks like the fit is going to hit the shan soon. Yes, there are small refunds because they didn't withhold as much in taxes, dumbass. Anyone that gets a refund is a moron. Why do you give the government a tax free loan? They sure as hell don't give you the same consideration. Why are liberals so economically illiterate? You can't itemize state? Are you stupid? ^^ another liberal moron that makes a statement of fact, that is simply not true. My God you people are morons.